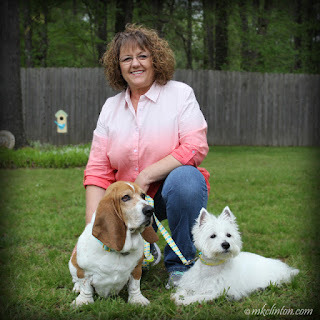 This post is sponsored by PetSmart® and the BlogPaws® Pet Influencer Network. I am being compensated for helping spread the word about PetSmart Grooming Salons, but Barking from the Bayou/mkclinton.com only share information we feel is relevant to our readers. 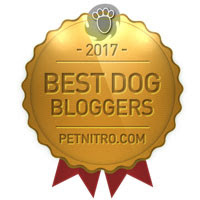 PetSmart is not responsible for the content of this article. 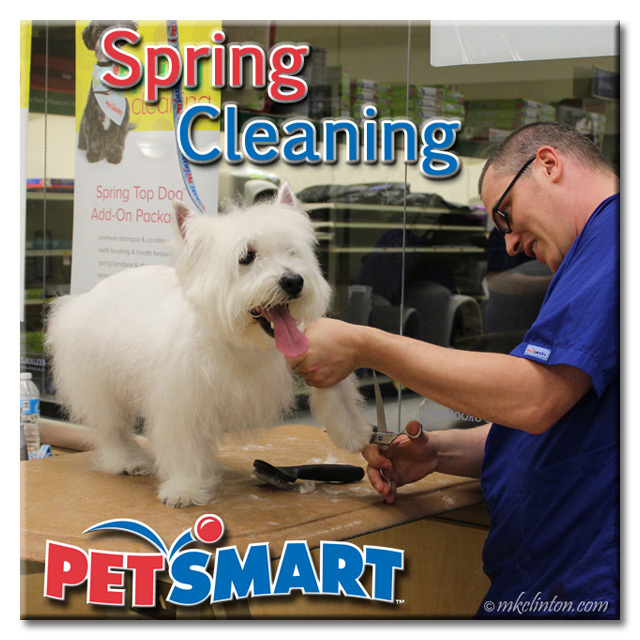 It is time for spring cleaning and that includes our dogs. There is nothing that rejuvenates Pierre more than shaving off his heavy winter coat. 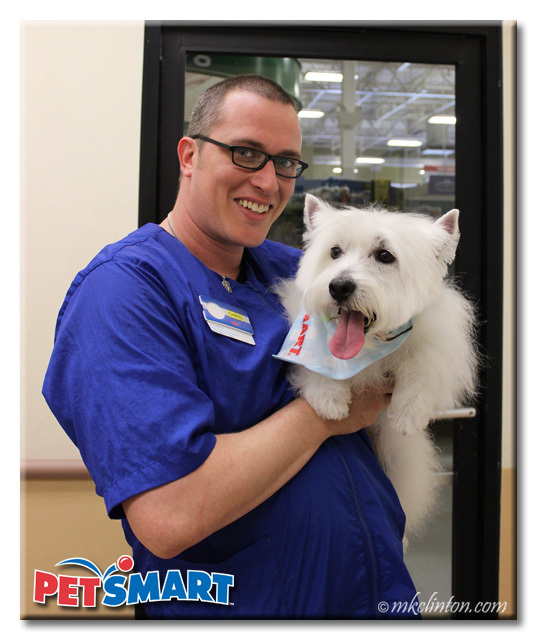 We were so happy to see Chris, our PetSmart® Groomer. 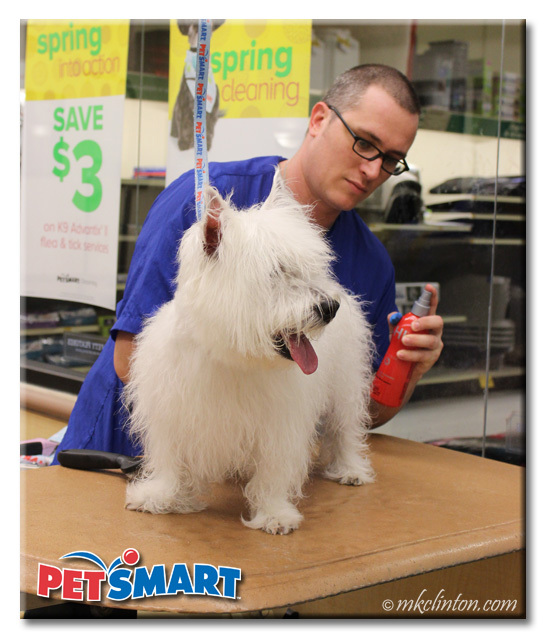 I think Pierre knew he was about to be a clean and happy White West Highland Terrier again! Booking an appointment online is so easy. You can even select your favorite groomer. 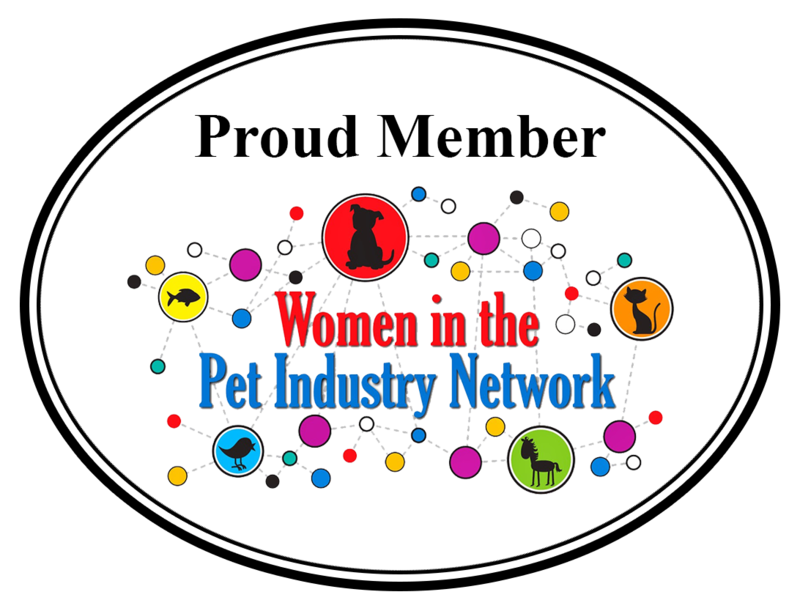 All of the salon associates acquire annual safety certification and additional coursework to learn about dog anatomy, how to spot stress and common pet medical problems. Groomers receive an additional 400 hours of training. If it is your first visit, you can relax knowing they are all awesome and very well-trained. 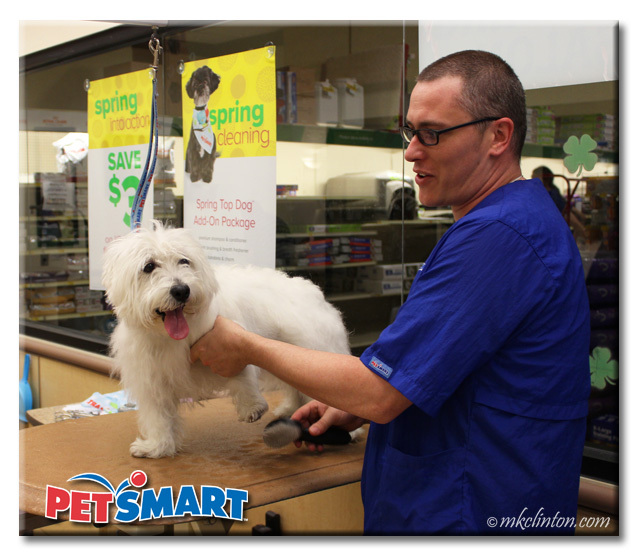 The thing I noticed was all the smiling faces of the PetSmart Grooming staff. Chris told us, “When you love dogs, there is no better way to spend your day. I’m always glad to come to work.” It is obvious that he means it. 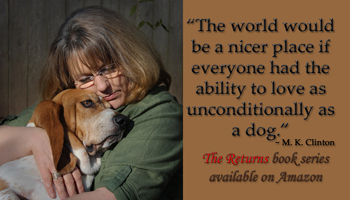 Pet parents can tell when someone loves their pet. After Pierre was brushed and some initial shaving was done, it was off to the back for a bath. Chris noticed that Pierre’s hair was dry and suggested the Top Spaw Treatment with a CHI® Conditioner. vitamin D, aloe vera, and honey. After his bath and CHI conditioning, Chris finished the trimming and shaving. Pierre was transforming before my eyes. I loved watching Chris work his magic. He could give Edward Scissorhands a run for his money! It didn’t take long before Pierre was looking ready for spring and Easter photos. For the first time, he was treated to a nail grinding. He seemed to prefer it over the nail clippers. I will use the walk-in service between haircuts to keep them nice and smooth. They also offer walk-in services for ears and teeth cleaning. 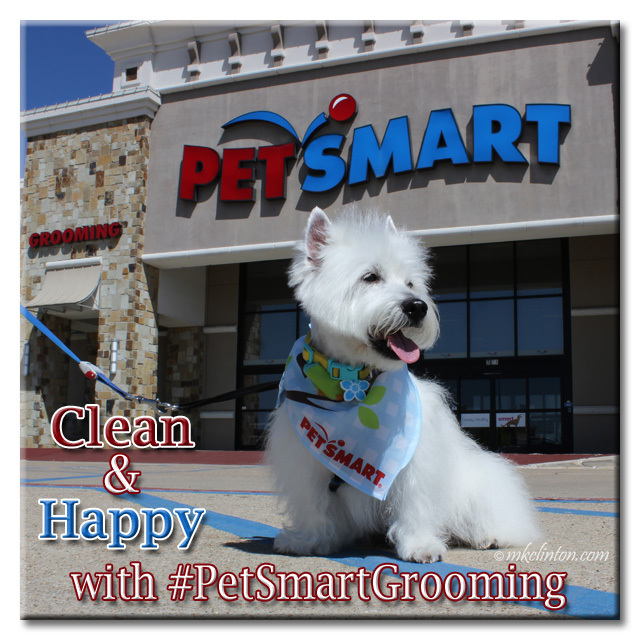 PetSmart makes it easy to maintain your dog’s great looks between grooming by selling the same products your groomer used in their store. I was so impressed with the CHI Detangling Finishing Spray that I bought a bottle. 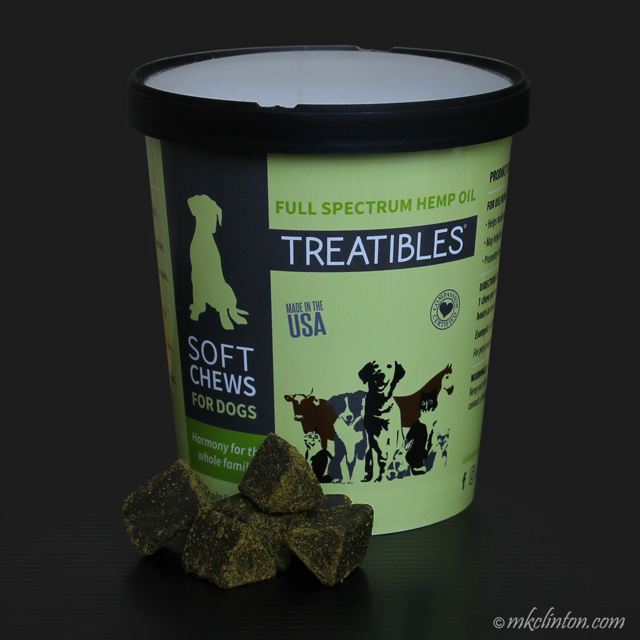 Your groomer will tell you exactly what they used to give your pet their amazing feel and smell. You’ll also receive a Pawgress Report explaining the services your pet received and groomer notes. Pierre scored an A+. There’s also some great money saving coupons included in the report. If you want to drop off your pet for their salon appointment, your groomer will text or email you when they are ready to be picked up. 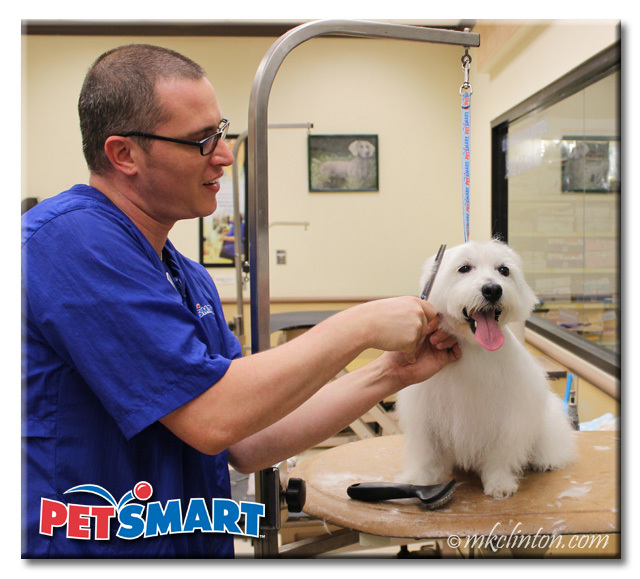 PetSmart Grooming is the perfect place to take your dog for a bath, nail trim or deshedding treatment. 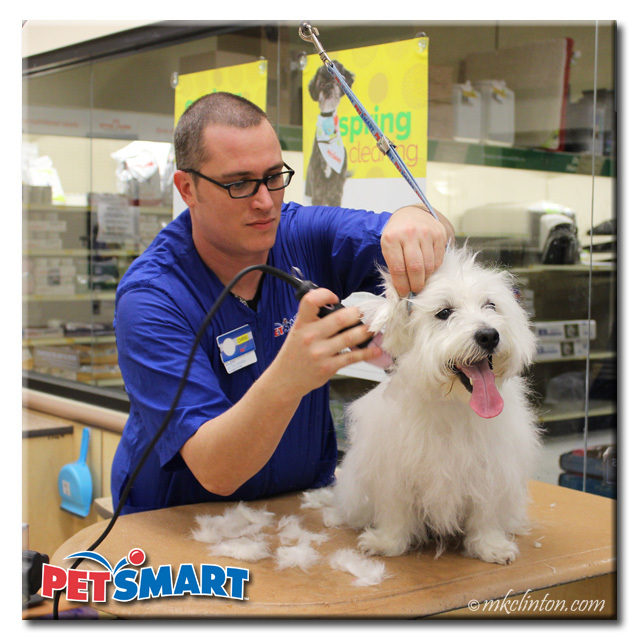 If you are looking for the perfect salon for all of your pet’s grooming needs, PetSmart Groomers is the place. 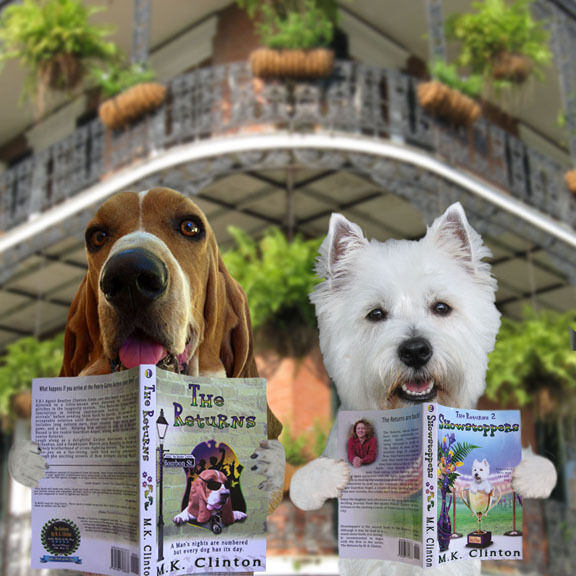 They even offer a “Look Great Guarantee” that promises you’ll be happy with your pet’s service or they will do whatever it takes to make it right. · All pets need current rabies vaccinations with proof from your vet. 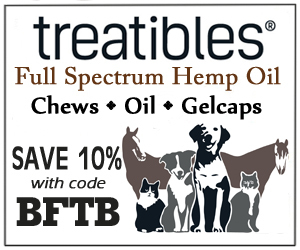 · Rabies vaccines need to be administered at least 48 hours prior to service. 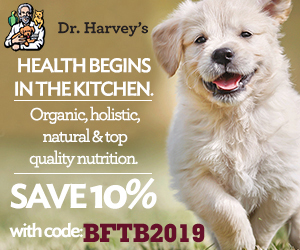 · Your pet must be over 8 weeks of age. 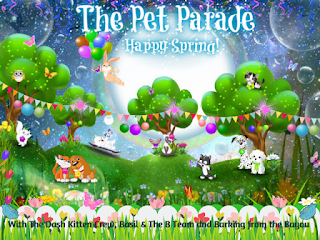 · Customers cannot go behind the double doors separating the Salon lobby from the grooming area. This is for the safety of pets and associates. Follow PetSmart on Instagram, Twitter, and Facebook. He is like snow white! I wouldn't let him outside ever again for fear he might get dirty! Looking so beautiful! We love PetSmart! Your dog was beautiful before but it is amazing the transformation a great cut does. We just had our 3 cut last week. What a difference! We love PetSmart! We love our long time groomer but in California there is no certification requirements for a groomer. Anyone can just hang out a groomer sign which is kind of scary. Wow, you look all full of Spring handsomeness! Looks like he did a super job for you. Very handsome! We got spring cleaned on Monday! Pierre looks all spruced up! All ready for the holiday! Pierre looks so pawesome - and happy!! I love that the PetSmart folks always seem so happy to see us pups (and kitties, and other critters)! Pierre! You look so handsome!! Wow, Pierre looks fantastic, just like a movie star! I can see how happy he looks after his spa day. Your groomer Chris is definitely a gem, you can tell he's really passionate about dogs. 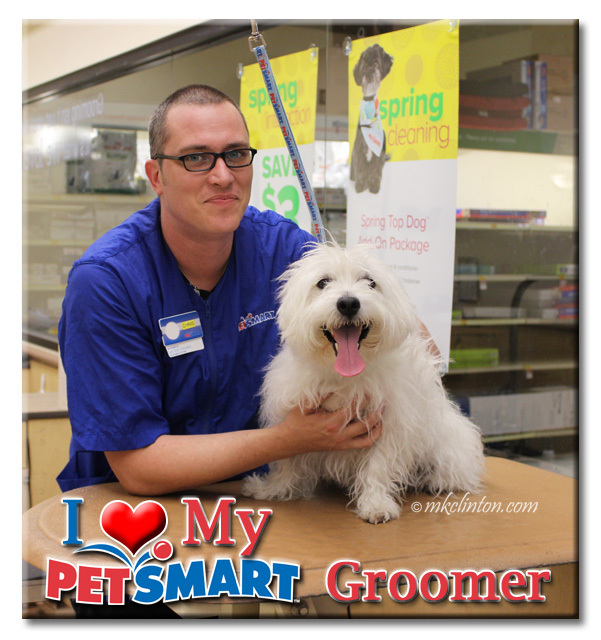 We love our PetSmart groomers too, they have so much passion & expertise. Looking good Pierre!! Love the clean smell of a freshly washed pup!! Pierre dood, you are STYLIN'!! Pierre, you are so handsome! Sshhh... don't tell Bentley I said that. Pierre looks so adorable after his grooming!! I love that PetSmart gives their groomers so much training. 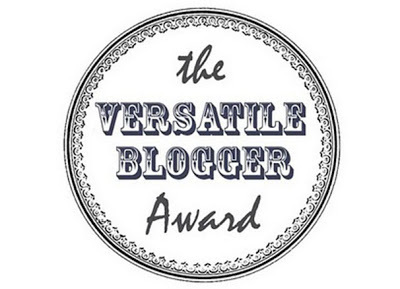 By the way, I subscribed to your blog so I'll get all of your updates now! 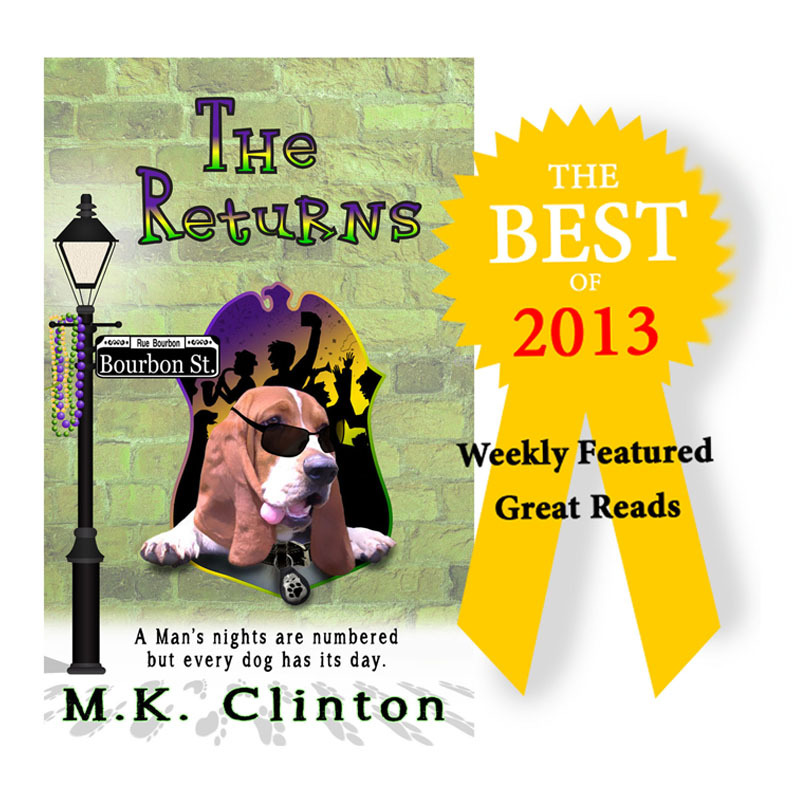 You really got the royal treatment, Pierre, and don't you look awesome! I have a regular groomer for Sparkle but I always use Petsmart when I can't get in or if I need touchups or baths in between. Pierre looks great! I love how soft my dogs after they get groomed at PetSmart. Such a smart, handsome doggy you are! Pierre you look so handsome! Pierre you look barkingly handsome. I better your smelling pretty good too. Good job on the A+ report card. Pierre looks amazing! PetSmart really did a great job! Your photos are awesome too! What a nice job!!!! So stinkin handsome. Wow! They did great. 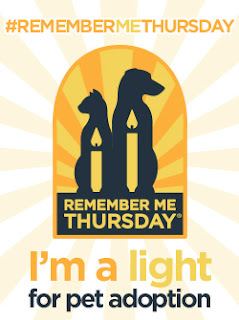 I have a coupon for a free grooming session at Petsmart. I will need to go use it! Pierre looks great! I wish I could find a great groomer who knows how to groom Persians without shaving them.